HECKLER&KOCH UCP The German firm of HECKLER&KOCH shown for the first time at the latest MILIPOL 2003 expo in Paris a brochure showing a new semi-automatic, special-purpose combat pistol currently in development. 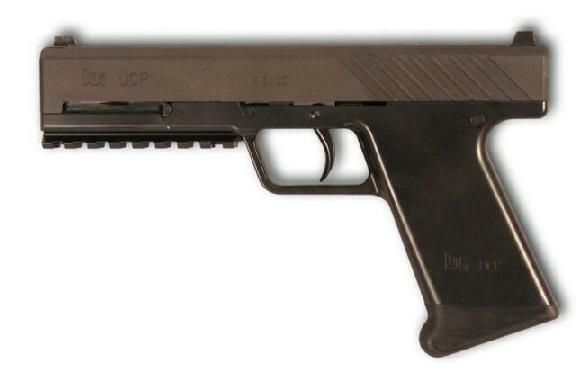 The pistol, designated as UCP ("Ultimate Combat Pistol", or "Universal Combat Pistol" according to the sources) is a gas-operated, delayed-blowback working combat handgun chambered to take 20-rounds capacity magazines and fire the same .4'6x30mm-HK armor-piercing proprietary cartridge used in the latest HECKLER&KOCH submachinegun, that very same MP7-PDW that NATO has recently adopted to equip ALL the pilots and crewman of the AWACS radar planes, and ALL means also the American ones. In fact, the UCP is purpoted to be a "mate-up semi-automatic sidearm for the MP7-PDW", but in fact it has been developed as an alternative for those who can not have with them the MP7-PDW on duty but would like to have a tactical handgun firing an armor-piercing cartridge: this includes many Military Special Forces, and the Law Enforcement market. The UCP features a MIL-STD rail under the frame, to fit tactical accessories such as lights and laser designators, and it can be fitted with a proper sound suppressor. Just a curiosity: the UCP fits the US DoD standard requirements for the OIPW (Objective Individual Protection Weapon), the programme started along with the OICW, OCSW, OSW, and so on, and aimed to develop the future sidearm for the American soldier. Is every single American military going to have an HECKLER&KOCH UCP at his side in the near future? Only time will tell. These are the only news available by now. The launch of the UCP is expected as far as end 2004 / beginning 2005.